ww2dbaseUSS Blackfin was commissioned into service with the United States Navy in the summer of 1944 with Lieutenant Commander George Hays Laird, Jr. She arrived at Pearl Harbor, Hawaii, United States in Sep 1944, and embarked on her first of five war patrols on 30 Sep. She operated mainly off China in the South China Sea and the Yellow Sea. She sank Japanese cargo ship Unkai Maru #12 on 1 Nov 1944 and Japanese destroyer Shigure on 24 Jan 1945; the two sinkings totaled 4,325 tons. During the fifth war patrol, the Pacific War ended with the Japanese surrender. Immediately after the end of the war, she performed lifeguarding duties and assisted in mine clearing operations, destroying 61 mines during the latter mission. She arrived in Guam, Mariana Islands on 5 Sep 1945 to receive fuel and repairs, and then departed for San Diego, California, United States to join Submarine Squadron 1. Through Jul 1948, she conducted patrols in the Pacific Ocean, typically in waters surrounding Mariana Islands and Hawaii Islands. She was inactivated at Mare Island Navy Yard in California, United States in Jul 1948, and was decommissioned there in Nov of the same year. In Nov 1950, Blackfin underwent the GUPPY modernization program to increase her performance. 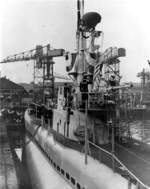 Upon completion of the conversion, she was recommissioned into service on 15 May 1951 to operate with the Submarine Force of the Pacific Fleet, which was based in San Diego until 8 Mar 1954 when it was moved to Pearl Harbor. Between Dec 1951 and Jun 1952, she toured the Far East, and then repeated a similar voyage again between Jan and Jun 1955. She was decommissioned for the second and final time on 15 Sep 1972, and was sunk by a torpedo as a target ship during the exercise "SubSinkEx Project Thurber" off San Diego in the following year. 10 Jun 1943 The keel of what would become USS Blackfin was laid down. 12 Mar 1944 Submarine Blackfin was launched by the Electric Boat Company in Groton, Connecticut, United States, sponsored by the wife of US Navy Rear Admiral Charles A. Lockwood. 4 Jul 1944 USS Blackfin was commissioned into service with Lieutenant Commander George Laird, Jr. in command. 11 Sep 1944 USS Blackfin arrived at Pearl Harbor, US Territory of Hawaii. 30 Sep 1944 USS Blackfin departed from Pearl Harbor, US Territory of Hawaii for her first war patrol. 1 Nov 1944 USS Blackfin sank Japanese cargo ship Unkai Maru #12. 24 Jan 1945 USS Blackfin sank Japanese destroyer Shigure in the Gulf of Siam about 160 miles from Kota Bharu, Malaya. 5 Sep 1945 USS Blackfin arrived at Apra, Guam, Mariana Islands. 15 May 1951 USS Blackfin was recommissioned into service. 15 Sep 1972 USS Blackfin was decommissioned from service for the second and final time and was struck from the US Navy Naval Register on the same date. 13 May 1973 Submarine Blackfin was sunk as a target ship off San Diego, California, United States.